The new standard EN 81-20 was approved in 2014 by the European Committee for Standardization CEN and released end of year 2014 by the Deutsches Institut für Normung DIN. This release means that the EN 81-20 standard is regarded as approved and mandatory in Germany. From 1. September 2017 on, the EN 81-20 standard will be the only valid standard. As an interim phase, the two existing standards EN 81-1/2 will be effective in parallel to the new standard EN 81-20 until 1. September 2017. The EN 81-20 standard applies for both electrical cable and hydraulic lifts and will thus replace the existing standards EN 81-1 and EN 81-2. The new standard applies for passenger and material lifts. It determines the rules for the construction and installation of lifts which had to be adapted to remain state of the art. Another purpose of the standard is the definition of safety standards to achieve a better protection of passengers, service personnel and inspectors against accident risks which can occur during normal operation, maintenance and emergency operation. 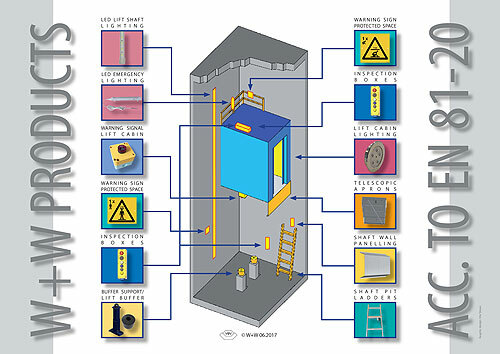 Through these changes, the safety standards in the lift industry, which are already very strict, will be further improved. The new safety regulations apply mainly to lift maintenance. Examples are the enlargement of safety spaces on the car roof and in the pit as well as the the increased requirements regarding pit ladders, guard rails for the car roof and protection covers. Further requirements like the brighter cabin lighting and the changed shaft lighting help to prevent accidents too. For a considerable time W+W Aufzugkomponenten has been concentrating on the adaption of existing products and development of new products which comply with the requirements of the EN 81-20 standard. On the Interlift 2017 many of these products could be presented and offered the customers the chance to get first-hand information. Customers can already now employ the products which comply with the new standard. In case of any question regarding the EN 81-20 topics, please get in touch with our contact persons which you can find under contact in www.wwlift.de. They will be happy to help you.